Essential Water Minerals Tests role in aquatic growth and algae blooms. 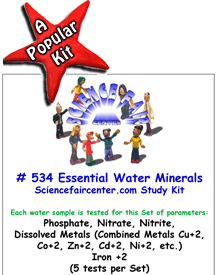 Essential Water Minerals Tests. Experiment for a first time science fair project. Water samples from lakes, creeks, ponds, rivers etc are tested for essential minerals required for biological growth. Testing only takes a few minutes per sample. 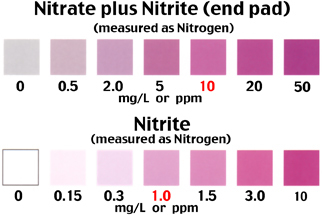 Each water sample is tested for this Set of parameters: Phosphate, Nitrate, Nitrite, Dissolved Metals (Combined Metals Cu+2, Co+2, Zn+2, Cd+2, Ni+2, etc.) and Iron +2 (5 tests per set). Essential minerals role in aquatic growth and algae blooms. Experiment for a first time science fair project. Water samples from lakes, creeks, ponds, rivers etc are tested for essential minerals required for biological growth. Testing only takes a few minutes per sample.